My name is John, and I am the enigmatic supervillain known, to some, as The Librarian for the Hermetic Library. I would love to have your support and encouragement to continue the ongoing work and expansion of all the projects related to this site while also joining me here as a Patron! It’s a pleasure and a privilege to be of service as the librarian, but, moreover, your interest and support for the work of the library is very much appreciated. You make what I do possible! You keep the library online! Thank you! As an ongoing Patron of Hermetic Library, you help keep the site online and open access, so that it can be a resource for everyone, for millions of visits a year by researchers, academics, practitioners, students, and the curious! There's a lot of benefits now that you are part of the insider circle of supporters doing your part to keep the site alive and growing. As a Patron, you help determine the future of the site by supporting my work at digital preservation and presentation of important works in the living Western Esoteric Tradition, Hermeticism in a broad-sense, and Aleister Crowley’s Thelema. Not only that, but you will also support all the work I do with encouraging new music, art and letters from those who feel drawn to these topics and ideas, or, especially, incorporate and manifest ritual and magick in their works. As a Patron, you help make the magick. Gander at the variety of perks available. Select the best level of ongoing support that you are able and willing to pledge. And, let's conjure our community and evoke excellence together! 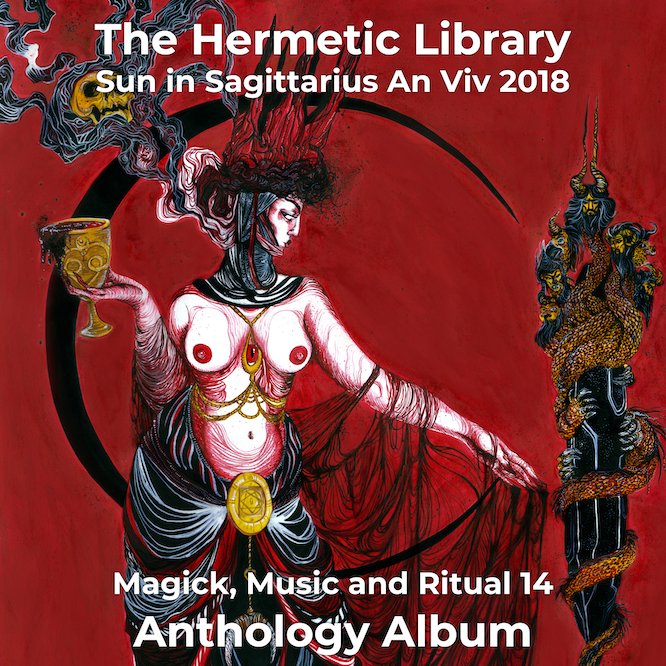 I have recently released Magic, Music and Ritual 14, the Hermetic Library Anthology Album for 2018 on the anniversary of the library's birthday on Dec 3rd, 1996. Over twenty years! Your support will give me the chance to find out and share with you what is possible for the future. Let's do this together! Patreon is not the only way to support the work of the library. If you'd like other options, I would ask you to consider this alternatives: you could subscribe at Bandcamp. I have set up both of this alternative in order to provide a variety of ways to support my work that might suit your preferences. There are many other ways beyond these to help support the work of the library, but if you've an idea not mentioned let's talk about that too! If you pledge $1/month or more to help support the work of the library, I will gladly send you one gratis download code for any previously released Magick, Music and Ritual anthology Hermetic Library Albums to say thanks for your support! You can use that download code yourself, or even give it to someone else as a gift. Your first code will be sent after your first month as a Patron, and, while you are an active Patron, you will also get an additional gratis download code for each new annual anthology release as they become available. • You help keep the site online and open access, so that it can be a resource for everyone, for millions of visits a year by researchers, academics, practitioners, students, and the curious! • You are welcome to use an ad blocker totally guilt free when viewing the site. An extra $99 off Carolyn Elliott's INFLUENCE online course on practical magic! If you pledge $5/month or more to help support the work of the library, in addition to previous rewards, you will have privileges to participate in an exclusive Patron Lounge on both Hrmtc Underground BBS and voice-chat. In our private Patron Lounge on the BBS, you will be able to take part in the submissions process for new work that may be accepted for publication on the library blog, and more. You will have exclusive access to new pitches, and let me know what you think about each pitch idea, for example if this pitch describes something you’d like to read, sounds if the submission has interest and impact, and so forth. And, you will have exclusive early access to all submissions, and have a chance to weigh in on whether those are something the library audience would like to read, has interest and impact, and so forth. Are you also a Creator on Patreon? As a Patron of the library with a pledge of $5 or more, let me know if you've got a Creator profile on Patreon. I’ll also paying it forward by supporting you for $1/mo. This will list you on the library's Patreon page as a Creator that the library supports. That way people who check out Hermetic Library will also be see your related campaign. Research Topics — Patrons at this level will participate in the creation of a list of research topics they would like to have researched. Funds will be reserved toward honoraria for Fellows and guests who can respond to these specific topics. The results of this research will be made available via the Hermetic Library site for everyone, but Patrons at this level will be given early access to the research before it is publicly published and have an opportunity to interact with the researcher to ask additional questions about the research. Postal Exchange — Every couple of months, when I have new things to send you, I will mail spiffy stuff for Postal Exchange. The contents of these packages will be a surprise, but could include a selection of interesting goods from Occult vendors and friends of the library or tchotchkes and other things sent to me or that I find to share interesting eclectic, esoteric tchotchkes and items with Patrons. I have special Postal Exchange boxes made in which to ship your share of the loot. If you've ever checked out any of the various subscription box services, it's like that; only more random and more bizarre. Publication Subscription — In addition to getting fun things through Postal Exchange, I will also periodically send you publications, such as books, zines, or other published items related to the subject matter of the library. You will gratis downloads of the entire catalog of digital publications, and all new issues as they are released. A basic monthly funding level for the library. If just 1% of the people on social media following the Hermetic Library, or an even smaller fraction of those who visit the library site, were to become Patrons then we would cover all the monthly costs of keeping the library online and provide additional resources to start expanding; such as paying additional creators to help with new content and additional help in preparing and proofing more relevant public domain material. I pledge that all funds beyond the basic funding goal will be paid forward to help support other creatives, projects, researchers, &c. doing esoteric and occult work similar to the library.